It was a warm, humid Friday night last week that brought a number of Irish music lovers and supporters to the East Side town house of Irish businessman Tony White and his wife Clare for a very special occasion. In a manner reminiscent of the patrons of Irish pipers and harpers centuries ago, White recently spied and admired a young animated young uilleann piper playing at the weekly Saturday afternoon session at Lillie’s Victorian Bar to whom he would open his own beautiful home for a CD launch in New York when it was released. That young man was a native of Southern California named Joey Abarta, who became infatuated with Irish music and the pipes after hearing a recording from Leo Rowesome, one of Ireland’s seminal piping influences as a player, pipe maker and teacher. He sought out Pat D’Arcy, one of the organizers of the piping fraternity and tionols on the West Coast for lessons, and set himself on that long, hard road to mastering Ireland’s native instrument the uilleann pipes. Abarta became a very determined piping student and the musical canon associated with it down through the years as he traveled throughout the U.S. and Ireland to further understand the music and cultivate in his own repertoire. At fleadhanna, festivals or piping tionols he was an ever present and eager musician soaking up the musical feast at hand. His affable nature and penchant for donning vintage clothing, including fedoras, ties, waistcoats and jackets, added years to his otherwise youthful demeanor and made him a welcome sight on the Irish music scene. To become more fully immersed in it he relocated from Los Angeles to the Northeast and in particular the Boston area with its plentiful sessions and enviable young musician demographic which would allow him more playing opportunities. Abarta also became noticed by the tiller of America’s Green Fields, Dr. Mick Moloney, who recruited him for some of his tours around the country and recently to Ireland as well. These days to establish your musical bona fides, the calling card is producing a CD of your own. With the commercial market for CDs evaporating by the moment, artists have turned to crowd sourcing to raise the necessary funds to finance recording and production costs, and so Abarta turned to Kickstarter to successfully accomplish this task. He also teamed up with Daniel Neely, a musician and organizer (and writer) to produce his opus as Neely had an established track record producing CDs for his Washington Square Harp and Shamrock Orchestra, and also the Irish Arts Center and other roots music. 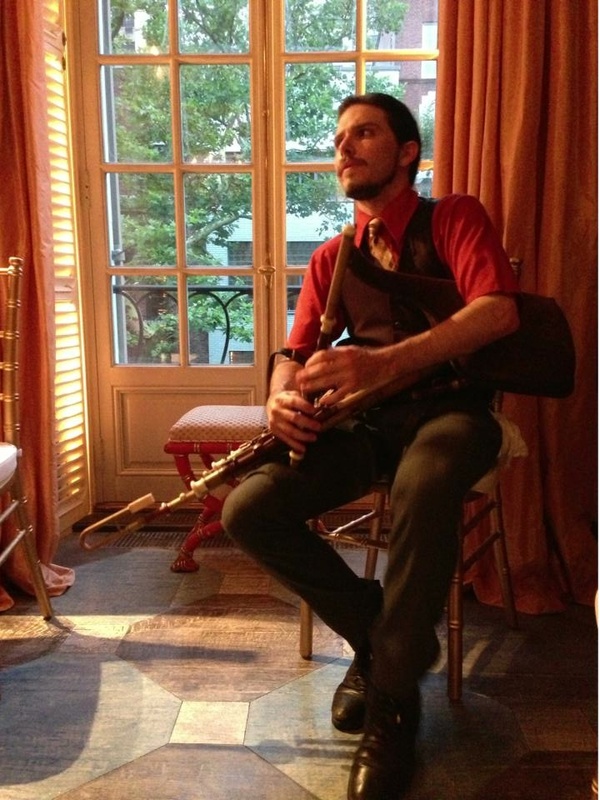 And the results are just in with Abarta’s new CD, Swimming Against the Falls (Snámh in aghaidh easa) showcasing his piping prowess throughout the unaccompanied 12 tracks chosen for the new recording using a set of pipes made by Benedict Koehler and David Quinn. Like all good pipers, Abarta has listened carefully to others who have told Ireland’s history with the use of the chanter, drones and regulator peculiar to their craft. Cited as sources from the piping pantheon are the legendary chief Francis O’Neill, O’Farrell, Seamus Ennis, Felix Doran, Leo Rowesome, Patsy Tuohy, Willie Clancy, Tommy Reck who kept the piping tradition alive before going into the ground and also Pat Mitchell, Tommy Keane, Sean McAloon and Abarta’s teacher Pat D’Arcy who are still with us and stoking a great revival of uilleann piping all over the world. Abarta has discovered that one of the keys of discovering the intrinsic soul of Irish music is to hear it played through the pipes, and that is a mission that has defined his participation in furthering Irish music appreciation and enjoyment. For more information visit www.joeyabarta.com.